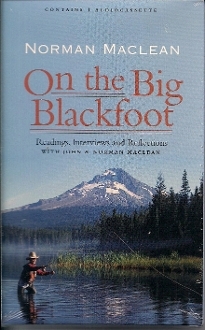 Norman Maclean spent his formative years fly fishing on the Big Blackfoot River. This moving audio retrospective is a portrait of the river's influence on Maclean's life and on his understanding of the human experience and man's connectedness to nature. Recollections by his sone, Johnn, and archival readings by and interviews with Norman Maclean are interwoven into a tapestry of family life; son remembers father, father recalls brother. Set agains gurgling sounds of the Big Blackfoot River, their voices recount a bittersweet love across the generations. It is a story sure to leave the listener, like Maclean, "haunted by waters."